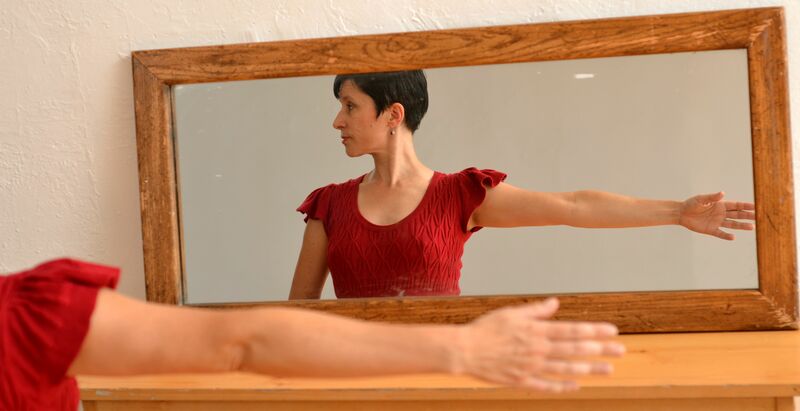 Emily Stein has been dancing, choreographing and teaching in Chicago since 1987. Her career has been long and varied, and she believes strongly that this variety of experience deeply reinforces the universal power of dance as an art form that is relevant in contemporary society. Her earliest dance training was in Buffalo, NY, focused on classical ballet. She attended the University of Iowa, where she studied with Francoise Martinet, and earned her BA in Dance in 1987. It was at Iowa that she began teaching ballet and also first experienced modern dance. It was also at Iowa that she discovered choreography. After graduating, Emily moved to Chicago, where she worked with many companies and choreographers and appeared in countless Nutcrackers. In order to explore her interest in choreography and teaching, she left Chicago in 1990 to pursue her MFA at Smith College. She served as a teaching fellow at Smith College, Hampshire College and the University of Massachusetts at Amherst. While at Smith, Emily’s choreography was chosen to represent the college at the American College Dance Festival at Bennington College. Upon returning to Chicago in 1992, she began to produce her own choreography independently, and joined Zephyr Dance in 1993. Emily began dancing and choreographing for Zephyr Dance in 1993, and was named Associate Artistic Director in 1997. Over eighteen seasons, she had the privilege of performing and presenting work with Zephyr at numerous Chicago venues and throughout the country. Her choreography has been seen in New York City at the Mulberry Street Theater and Cunningham Studios and in Toronto at the Winchester St. Theater. Her work has also been seen at the Cleveland Public Theater, Ohio; the Art and Culture Center of Hollywood, FL; the Margaret D’Houbler Theater, Madison, WI and Barking Legs Theater in Chattanooga, TN, among others. As Associate Director Emerita, she continues to teach Zephyr Dance company class and collaborates with Zephyr artists both in and out of the studio. Upon retiring from Zephyr Dance in 2011, Emily began to work on the series Secret Experiments in Ballet. This ongoing series, which investigates the intersection of ballet and experimental dance, includes informal showings, as well as fully produced performances in non-proscenium spaces. In May 2018, she premiered SEB #5: The Godmothers, which took as its inspiration the fairy godmother solos from the classical ballet Sleeping Beauty. Exploring the “fairy godmother” imagery from ballet tradition and folk and fairy tales, she created six unique, dynamic solos for riveting women whose dance backgrounds include ballet, West African, hip-hop and modern dance. SEB #1: Breakfast to Dessert took place at OuterSpace Studios in Chicago in November 2012. The studios, hallways and lounges of Visceral Dance Center hosted the performance of Secret Experiments in Ballet #2 in 2013. SEB #3: Corps/Corpus was commissioned as part of a 2014 artist’s residency at Benedictine University, and was performed in the school’s Komechak Art Gallery. SEB #4: Phantom Dance inaugurated the performance space at Dovetail Studios in April, 2016. In 2002, she participated in Deborah Hay’s Solo Performance Commissioning Project, and has performed Hay’s solo, Beauty, in Chicago, Washington and Michigan. Emily’s choreography has been nominated for a Ruth Page Award and a Chicago Dance Achievement Award, and has been seen in the Dance Chicago festival and Chicago’s NEXT Dance Festival. She has also created dances for students at Niagara County Community College, the Dance Center of Columbia College, and the Joseph Holmes Chicago Dance Theater. Teaching has been an important aspect of Emily’s dancing life since 1983, when she began teaching in the University of Iowa’s Talented and Gifted children’s program. Widely known in the Chicago area for her classes in ballet technique, she has worked with students from myriad backgrounds and all levels of experience, and enjoys the challenges of helping them connect with ballet technique as a tool for their own bodies’ dancing. She is currently on the faculty at the Dance Center of Columbia College, where she teaches ballet and pedagogy classes. In addition to teaching, she served as Ballet Coordinator for six years, collaborating on curriculum development and evaluation for ballet technique. Prior to coming to the Dance Center, she served for five years on the faculty of the Barat College Conservatory of Dance teaching ballet and pointe technique, dance composition and dance history. Emily has taught widely in private studios and for other professional companies, including Dovetail Studios, The Space/Movement Project, Deeply Rooted Dance Theater, and Joseph Holmes Chicago Dance Theater, where she also managed the school. Since 1998, Emily has also worked as a teaching artist in public schools in Chicago and the surrounding area. Using the Zephyr Model of arts integration to connect the art to the core curriculum, she has created unique dance experiences for students at all grade levels in subject areas from Language Arts and Social Studies to Science and Math. She has been part of the Zephyr team developing innovative and powerful models for assessment in the arts, which earned Zephyr Dance the opportunity to provide state-wide training in assessment for teaching artists sponsored by the Illinois Arts Council. She has taught professional development workshops for teaching artists, classroom teachers and college students, helping them to develop and refine their teaching practices. Her newest body exploration and teaching endeavor is her work in the Feldenkrais Method of Somatic Education. Emily is a Guild Certified Feldenkrais Practitioner, and she teaches both group classes in Awareness Through Movement, and private lessons in Functional Integration. For more information about this work, visit Emily’s Feldenkrais website.